ADANA Saray Otel to a total of 20 rooms are available and serve with a capacity of 54 beds. In the morning, a good quality buffet breakfast with our service to make your day in the best way we have been making our best. Business and single trip or your family can stay when you travel within the city, but decent and away from the hustle and bustle of the city if you want to spend a quiet day you can choose to Adana Palace Hotel. Our House in the heart of Adana city center each field to reach because it is economical and allows you to reach quickly. 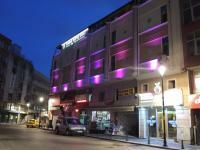 Adana Palace Hotel with affordable prices and livable environment is waiting to host you. All questions for suggestions and comments, please feel free to call us.